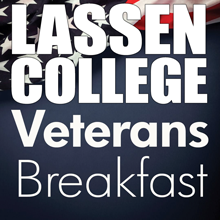 For a seventh year the Lassen College Men’s Baseball team will be honoring local veterans and their families with a free breakfast before Susanville’s Veterans Day parade and activities on November 11th. The event will be held at Monsignor Moran Hall, at the corner of Weatherlow and North Streets, from 8:00 until 10:30a.m. All veterans and their family members are welcome to the breakfast. For more information contact Glen Yonan at 310-1453.